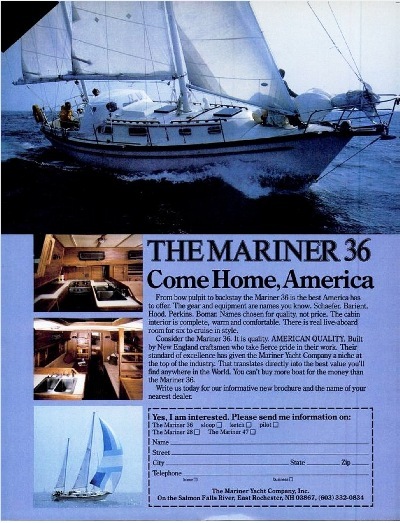 The Mariner 36 was designed to be a modern sailing auxiliary for the cruising family. 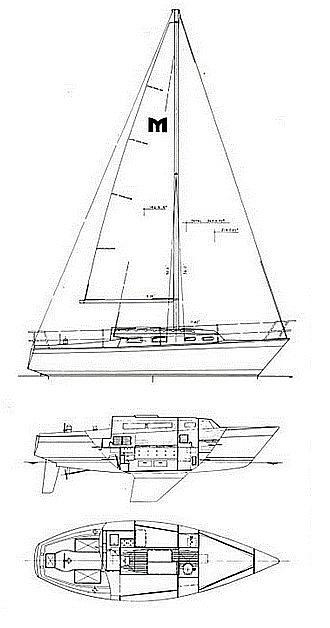 Owners may choose the sloop, ketch or pilot version. 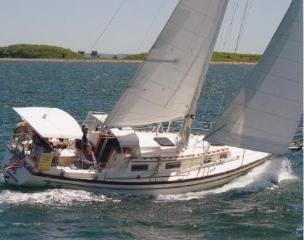 It is equally well suited to coastal cruising and offshore voyaging. Quality construction is the hallmark of the Mariner Yacht Company. The high-aspect-ratio masthead rig is keel stepped for stiffness. The Deck and cockpit lines are functionally clean and simple. Hefty gear for sail handling ease and precise trim adjustment includes all internal halyards, outhaul, topping lift, jiffy reefing system and large, properly-placed winches. Sail handling is efficient and safe under the heaviest sea conditions or with a shorthanded crew. The nonskid decks are wide and uncluttered, and there are sturdy, double lifelines and grab rails. The flush-mounted anchor locker at the bow is self-draining. Visibility is excellent from the large cockpit, which features watertight storage lockers and an aft lazarette. An LPG tank storage locker is isolated to port. The sharp entry of the hull, long waterline and full water-plane assure speed, obedient behavior and stability. A large skeg-mounted rudder well aft aids maneuverability. The foil-shaped fin keel gives excellent windward ability, and inboard-mounted chain plates allow close sheeting of headsails. A good performer over the entire wind range, the Mariner 36 has proved to be a successful club racer. Living accommodations with berth for seven in teak-finished cabin are luxurious. Light and good ventilation are provided by Bomar latches and eight screened opening ports. Standard features include hot and cold pressurized water system, three burner stove with oven, deck-loading icebox, full shower with separate vanity and numerous lockers. Four interior arrangements are offered, and customer alterations are available. Tankage for fuel and water is more than adequate to supply the requirements of offshore cruising. All mechanical and electrical systems are easily accessible for maintenance. Clarity of design, impeccable hand craftsmanship and attention to detail make the Mariner 36 a modern, semi-production yacht of uncompromising quality and lasting value.